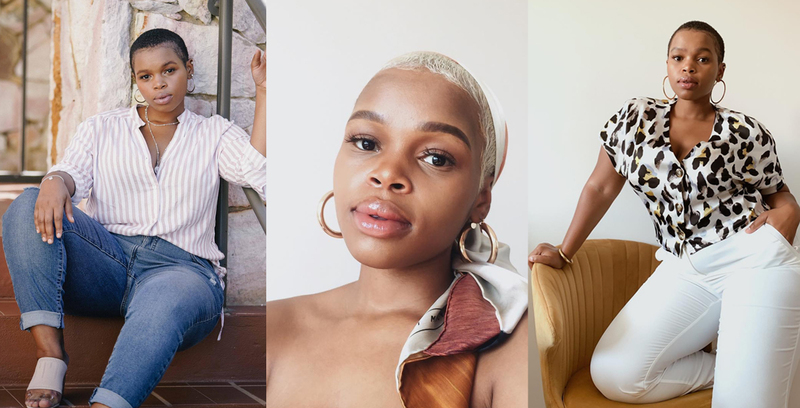 Body-positive activist Siphokazi Veti talks to us about online negativity, her meaning of self-love and what it takes to get there. When we meet up with body positivity activist and writer Siphokazi Veti on set in Cape Town, she’s every bit as radiant as she seems on social media. And while her personality bubbles with enthusiasm and an undeniable optimism, we soon find there's a depth to Siphokazi that is beyond her years. She opens up with the kind of refreshing honesty that is so rare in the age of social media. Maintaining that level of positivity and energy isn’t always easy she admits, especially when it comes to the relationship she has with her body. Rather, it’s a journey and a process that needs daily practicing. So when Siphokazi revealed some of her daily mantras for happier living, we were all ears. Why do you think it takes people so long to learn self-love? I think over time the world got lost in communication. Especially in media, and how it defined beauty and self-worth for so long. That kind of thing shapes young minds, and children lose something important at a young age. What were your experiences growing up regarding self-love? I had an eating disorder and social anxiety. On top of that, my body started changing and maturing from an early age, but I didn’t feel comfortable to ask advice to find out more about what was happening to me. And so for a long time, I didn’t feel comfortable with myself. When did you start feeling comfortable with your body? Only when I got to university, and started exploring feminism. That was a major turning point. A whole new world opened up for me. How did feminism help you through this? It taught me the importance of choice, individuality and fighting for who you are, and fighting to tell your story. It taught me to be proud of being a woman and the magic that is womanhood. Do you find yourself looking to other women for guidance and inspiration? I am inspired by so many incredible women, but I’ve had to take the path to self-love alone. I’ve realised I am my own healer. Until you can look at yourself in the mirror every single morning and love what you see, nothing else matters. And do you feel this way about yourself every morning? Definitely not every single morning. Every day is a new chapter. Every morning that I get up, I have to set my intention. I have to affirm my value and to affirm that I am enough. Self-love is a way to enjoy the journey with your body, without being hard on yourself. If I didn’t practice that and if I continued to pay attention to others’ perceptions of me, I think I would still be in a dark space. A space that never fulfilled my purpose. Do you ever experience negativity from people online? Practice self-love every day. Do not seek validation outside of yourself through instant gratifications. If you do that you will lose yourself, and you will stop telling your own story. Keep on learning, keep on questioning the world around you and what it’s telling you. You are your own healer, so trust your instincts and do not always turn to others to learn and understand. Have faith in your own perceptions. Remain authentic, because your story is important. I studied accounting, which wasn’t who I truly was. I was on a path where I could easily have been lost, but I remained true to who I am and what I want in life and steered myself in the right direction. Spirituality is important for reconnecting to your deeper, inner guide. It helps make sense of – and deepens – your purpose on earth. I grew up in a religious home, but over the years my definition of spirituality has broadened to include many different practices, including yoga. Be grateful for the time you – and your loved ones – have on this earth. My sister passed away several years ago. She helped me appreciate my own existence so much more. Her passing also made me realise that she had a powerful story, and it was never told… So her passing taught me to be grateful for the time we have, and to use that time wisely. beautiful read...one's own well being and happiness, protect yourself, practice good self care... a must read, siyavuma Siphokazi!